M. Night Shyamalan is a polarizing figure, which some adore and many others shun. 15 years ago, he burst onto the scene with a one-two punch that included The Sixth Sense and Unbreakable, one of the most impressive mystery films of the late 1990�s. But then, as the age of the 21st century came about, Shyamalan kind of lost his touch, or was unable to evolve it into the new age, constantly reverting back into his comfort zone of early X-Files episodes, both in terms of narrative and visual delivery. His subsequent films all lacked that synergy that could combine a twist-based idea with an interesting and attention-worthy movie plot. Instead of that synergy, most of them just ended up being a Twilight Zone episode turned into uninteresting films. Other, none-mystery films like After Earth were just horrendous and should be forgotten as quickly if possible. But now, out of nowhere, 15 years after losing artifact of cinematic super-power, Shyamalan found it in the most unlikely place � a horror comedy from the found footage genre. As a true 90�s man, Shyamalan did not venture into the found footage domain, even though I believe he was attracted to the business side of it (he is nothing if not a savvy business person). Now, with the Visit 2015, he created easily his best work in almost two decades. The film is refreshingly down-to-Earth from the get-go. In it, two teenagers, a sister and brother by the name of Becca and Tyler, leave their mom and go to visit their grandparents they never met. They arrive at their countryside home and first off, it�s all good: the grandparents are thrilled to see both of them while Becca films the entire experience as a documentary film. But soon, strange and bizarre things begin to happen and neither of them really knows how to approach newly formed and constantly changing circumstances. 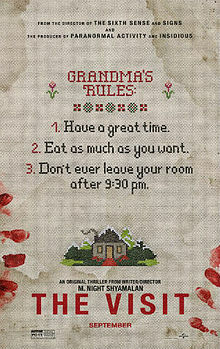 As a unique combination of dark humor and strong horror elements, The Visit is a film that cannot be easily compared with some other movie, especially in the terms of atmosphere. It could be said that Housebound (2014) has a bit of a similar goofy-scary vibe, but both ends of that spectrum are much more intense in The Visit. In a very smooth fashion, Shyamalan shifts the film from moments when the audience is grossed out and/or terrified into really odd comical moments that are equally unnerving as they are funny. All the while found footage cinematography never goes overboard with shaking and motion blurring, making the film easily watchable and even more easily enjoyable. As the plot becomes more and more ludicrous, so does the film's raw entertainment appeal intensifies. No one should doubt Shyamalan�s ability to make a solid film. With The Visit movie, he definitely showed that he can attain that precious synergy once again and move it right into the new age.